it will be the same for priest as for people, for the master as for his servant, for the mistress as for her servant, for seller as for buyer, for borrower as for lender, for debtor as for creditor. The earth dries up and withers, the world languishes and withers, the heavens languish with the earth. The earth is defiled by its people; they have disobeyed the laws, violated the statutes and broken the everlasting covenant. Therefore a curse consumes the earth; its people must bear their guilt. Therefore earth’s inhabitants are burned up, and very few are left. The new wine dries up and the vine withers; all the merrymakers groan. The joyful timbrels are stilled, the noise of the revelers has stopped, the joyful harp is silent. No longer do they drink wine with a song; the beer is bitter to its drinkers. The ruined city lies desolate; the entrance to every house is barred." 24:5 Modern society is concerned with physical pollution. God is concerned about moral pollution. God will destroy the physical planet because of the moral corruption. "houses barred" because of crime. The home is the last line of defense when the nation is overrun and the city is captured. 24:12 The city gate has been broken down. 24:14 This begins the rejoicing of the believers and godly survivors It is a song of Thansgiving. This song begins in the West. Isaiah heard it from there first. Then the East is exhorted to join and also the islands. This refers to rejoicing Gentiles. Therefore in the east give glory to the Lord; exalt the name of the Lord, the God of Israel, in the islands of the sea. But I said, “I waste away, I waste away! Woe to me! Pasha (Hb) – to transgress (Eng) - The Hebrew word pasha means “to transgress” and “to rebel.” If pasha is used in reference to nations it is translated as “rebel” as in 2 Kings 1:1 and 2 Kings 8:20. If pasha is used in reference to our relationship with the Lord the meaning is “transgress” as in Hosea 7:13 and Isaiah 66:24. I will live in righteousness by being honorable and keeping my word. I will avoid being deceitful and flee immorality. 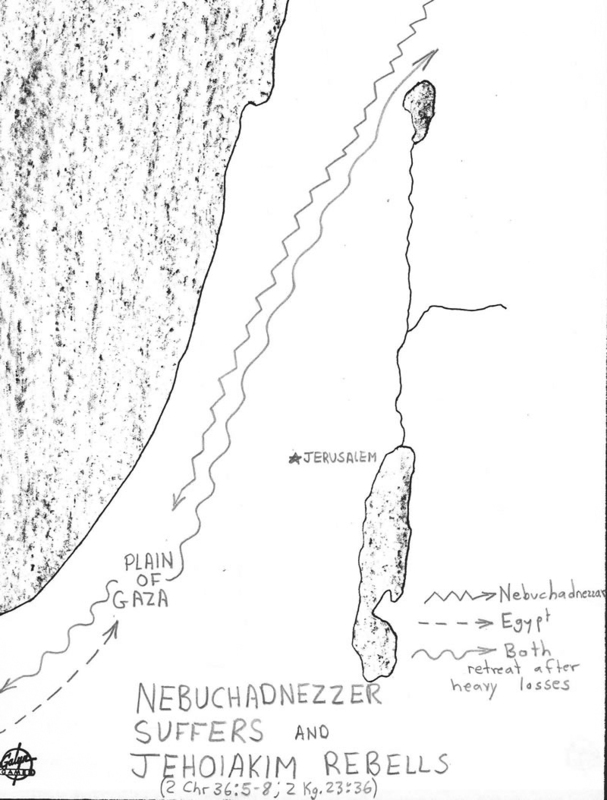 Details of 2 Kings 23:36-24:1 and 2 Chronicles 36:5-8 when Nebuchadnezzar suffered extensive losses on the Plain of Gaza vs. the Egyptians. This encouraged Jehoiakim to rebel against Nebuchadnezzar 601 BC even though Jeremiah sternly warned him not to (Jeremiah 36). "Kindness makes a person attractive. If you would win the world, melt it, do not hammer it." The names of Abraham's, brother, grandfather and great grandfather (Nahor 2x, Serug) have been found in the excavations of ancient Haran. 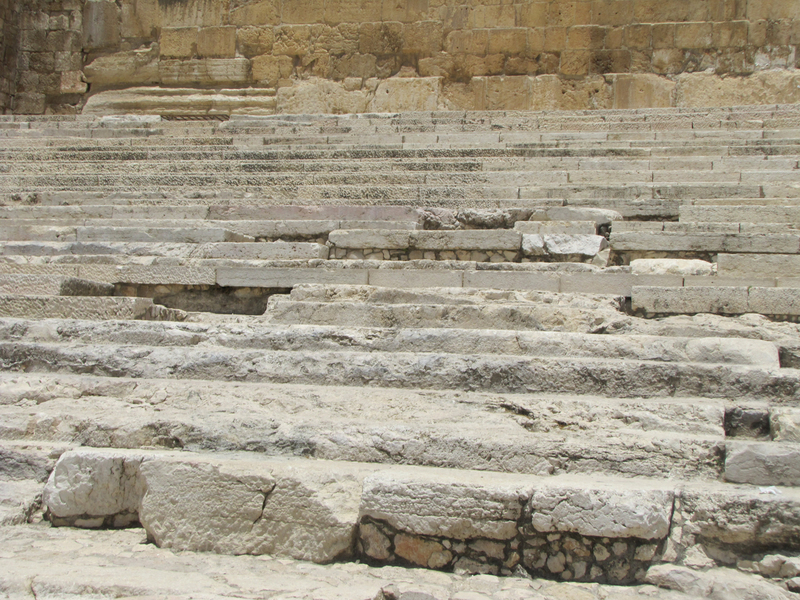 Abraham spent five years in Haran with his father Terah. "Take the garment of one who puts up security for a stranger; hold it in pledge if he does it for a wayward woman." 5 But the Babylonian[b] army pursued them and overtook Zedekiah in the plains of Jericho. They captured him and took him to Nebuchadnezzar king of Babylon at Riblah in the land of Hamath, where he pronounced sentence on him. 6 There at Riblah the king of Babylon slaughtered the sons of Zedekiah before his eyes and also killed all the nobles of Judah. 7 Then he put out Zedekiah’s eyes and bound him with bronze shackles to take him to Babylon. 8 The Babylonians[c] set fire to the royal palace and the houses of the people and broke down the walls of Jerusalem. 9 Nebuzaradan commander of the imperial guard carried into exile to Babylon the people who remained in the city, along with those who had gone over to him, and the rest of the people. 10 But Nebuzaradan the commander of the guard left behind in the land of Judah some of the poor people, who owned nothing; and at that time he gave them vineyards and fields. 11 Now Nebuchadnezzar king of Babylon had given these orders about Jeremiah through Nebuzaradan commander of the imperial guard: 12 “Take him and look after him; don’t harm him but do for him whatever he asks.” 13 So Nebuzaradan the commander of the guard, Nebushazban a chief officer, Nergal-Sharezer a high official and all the other officers of the king of Babylon 14 sent and had Jeremiah taken out of the courtyard of the guard. They turned him over to Gedaliah son of Ahikam, the son of Shaphan, to take him back to his home. So he remained among his own people. “But now listen, Jacob, my servant, Israel, whom I have chosen. This is what the Lord says— he who made you, who formed you in the womb, and who will help you: Do not be afraid, Jacob, my servant, Jeshurun,[a] whom I have chosen. For I will pour water on the thirsty land, and streams on the dry ground; I will pour out my Spirit on your offspring, and my blessing on your descendants. Some will say, ‘I belong to the Lord’; others will call themselves by the name of Jacob; still others will write on their hand, ‘The Lord’s,’ and will take the name Israel. Who then is like me? Let him proclaim it. Let him declare and lay out before me what has happened since I established my ancient people, and what is yet to come— yes, let them foretell what will come. Who shapes a god and casts an idol, which can profit nothing? People who do that will be put to shame; such craftsmen are only human beings. Let them all come together and take their stand; they will be brought down to terror and shame. The blacksmith takes a tool and works with it in the coals; he shapes an idol with hammers, he forges it with the might of his arm. He gets hungry and loses his strength; he drinks no water and grows faint. The carpenter measures with a line and makes an outline with a marker; he roughs it out with chisels and marks it with compasses. He shapes it in human form, human form in all its glory, that it may dwell in a shrine. He cut down cedars, or perhaps took a cypress or oak. He let it grow among the trees of the forest, or planted a pine, and the rain made it grow. It is used as fuel for burning; some of it he takes and warms himself, he kindles a fire and bakes bread. But he also fashions a god and worships it; he makes an idol and bows down to it. “Remember these things, Jacob, for you, Israel, are my servant. I have made you, you are my servant; Israel, I will not forget you. Sing for joy, you heavens, for the Lord has done this; shout aloud, you earth beneath. Burst into song, you mountains, you forests and all your trees, for the Lord has redeemed Jacob, he displays his glory in Israel. I will go before you and will level the mountains[b]; I will break down gates of bronze and cut through bars of iron. For the sake of Jacob my servant, of Israel my chosen, I summon you by name and bestow on you a title of honor, though you do not acknowledge me. so that from the rising of the sun to the place of its setting people may know there is none besides me. I am the Lord, and there is no other. “Woe to those who quarrel with their Maker, those who are nothing but potsherds among the potsherds on the ground. Does the clay say to the potter, ‘What are you making?’ Does your work say, ‘The potter has no hands’? “This is what the Lord says— the Holy One of Israel, and its Maker: Concerning things to come, do you question me about my children, or give me orders about the work of my hands? It is I who made the earth and created mankind on it. My own hands stretched out the heavens; I marshaled their starry hosts. Truly you are a God who has been hiding himself, the God and Savior of Israel. All the makers of idols will be put to shame and disgraced; they will go off into disgrace together. But Israel will be saved by the Lord with an everlasting salvation; you will never be put to shame or disgraced, to ages everlasting. For this is what the Lord says— he who created the heavens, he is God; he who fashioned and made the earth, he founded it; he did not create it to be empty, but formed it to be inhabited— he says: “I am the Lord, and there is no other. I have not spoken in secret, from somewhere in a land of darkness; I have not said to Jacob’s descendants, ‘Seek me in vain.’ I, the Lord, speak the truth; I declare what is right. “Gather together and come; assemble, you fugitives from the nations. Ignorant are those who carry about idols of wood, who pray to gods that cannot save. They will say of me, ‘In the Lord alone are deliverance and strength.’” All who have raged against him will come to him and be put to shame. But all the descendants of Israel will find deliverance in the Lord and will make their boast in him. Bel bows down, Nebo stoops low; their idols are borne by beasts of burden. [e] The images that are carried about are burdensome, a burden for the weary. “Listen to me, you descendants of Jacob, all the remnant of the people of Israel, you whom I have upheld since your birth, and have carried since you were born. “With whom will you compare me or count me equal? To whom will you liken me that we may be compared? They lift it to their shoulders and carry it; they set it up in its place, and there it stands. From that spot it cannot move. Even though someone cries out to it, it cannot answer; it cannot save them from their troubles. “Remember this, keep it in mind, take it to heart, you rebels. Listen to me, you stubborn-hearted, you who are now far from my righteousness.